The 1939 movie blockbuster Gone With the Wind is as legendary as the novel of the same name. Gone With the Wind’s author, Margaret Mitchell, had no desire to participate in the film project, but insisted that producer David O. Selznick employ a technical adviser to keep him honest about its portrayal of Southern accents, customs, wardrobes and etiquette. Mitchell’s choice for the job was her good friend and fellow Georgian, Susan Myrick. Raised on her family’s plantation near Milledgeville, Myrick (1893-1978) was a teacher, journalist, civic leader, and arbiter of all things Southern. Despite long days on the set of Gone With the Wind, she reported regularly and candidly to Mitchell about her quest to keep the movie’s production values authentic (in a 1939 kind of way). While researching his biography of Hattie McDaniel, who played “Mammy” in the movie, WKU history professor Carlton Jackson discovered how opinionated Myrick could be. Jackson’s research includes a copy of one of her gossipy letters to Mitchell, written just before filming of Gone With the Wind began. Myrick was “sick at heart” that “three Britishers”—Vivien Leigh, Leslie Howard, and Olivia de Havilland—had been cast in leading roles (Scarlett O’Hara, Ashley Wilkes, and Melanie Hamilton); but she liked Howard, who she found had “more sense than anybody I’ve seen around here” except for director George Cukor (a “grand person,” though he would soon be replaced). 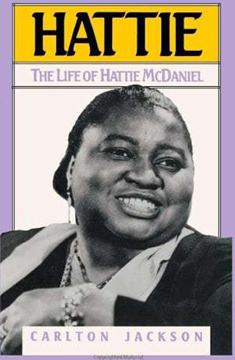 As for 44-year-old Kansas native Hattie McDaniel, the singer/songwriter/actress just signed to play “Mammy,” Myrick grumbled to Mitchell that she “hasn’t the right face” and “lacks dignity, age, nobility and so on.” Director Cukor admitted that he was still looking for another actress for the role; in fact, he sent Myrick to see the play Run, Little Chillun in order to scout its African-American cast for a replacement. But the rest, of course, was history. Not only did she keep her job, Hattie McDaniel owned the role of “Mammy” and received an Oscar for best supporting actress, making her the first African American to win an Academy Award. Carlton Jackson’s research for his book Hattie: The Life of Hattie McDaniel is part of the Manuscripts & Folklife Archives of WKU’s Department of Library Special Collections. Click here for a finding aid. For more collections, search TopSCHOLAR and KenCat.